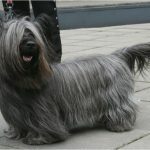 The Skye Terrier is one of the rarest and native breeds of Scotland, United Kingdom. These dogs are once bred to hunt animals like fox, badger etc, but now they turned to be a good companion breed. 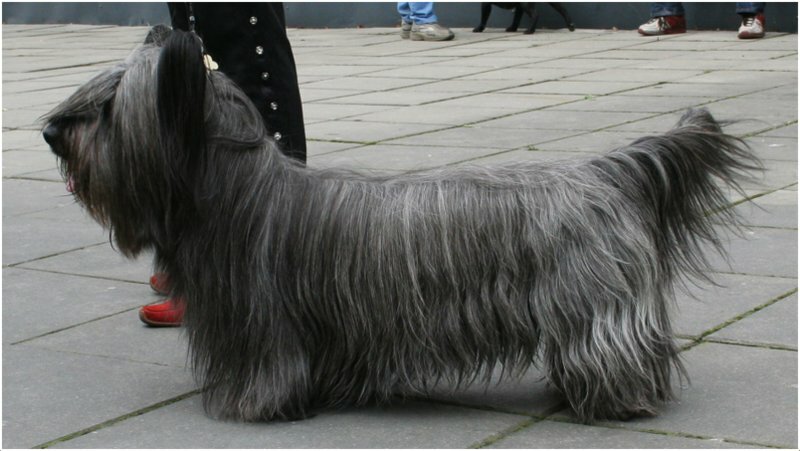 The Skye Terrier are once a popular breed when this was owned by several royal family members. 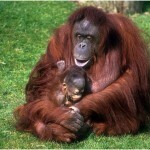 But on passing time its popularity has been diminished which put this breed into extinction. 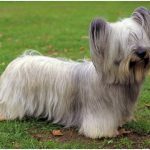 They have many notable characteristics which makes this a loyal pet. 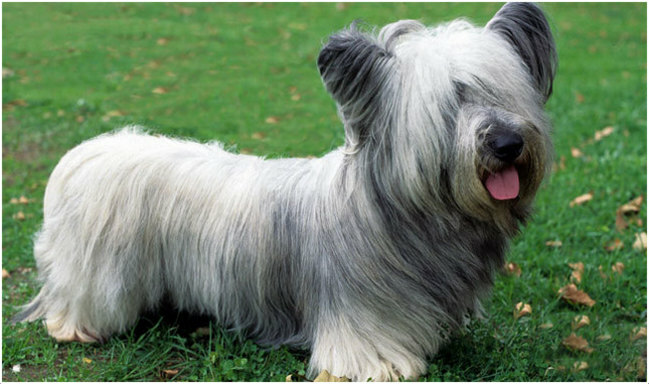 Earlier, Skye is bred to hunt animals but now this is one of the companion dogs in the world. Skye is not meant to left alone because this may feel bored, neglected and develops bad temperament. The Skye is meant for the families with older children who can interact with the pet easily. They may turn aggressive towards small kids as they may tease the pet. Skye doesn’t maintain good relation with other pets like cats and dogs. So this is not recommended for the families with pets like cats and small animals. They are stubborn sometimes and a patient trainer is needed as training the Skye may be difficult. 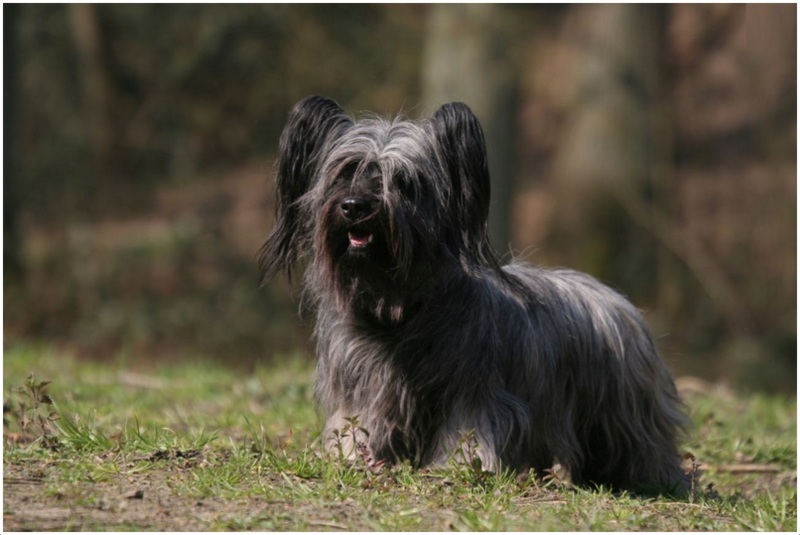 The Skye Terrier is not a hypoallergenic dog. 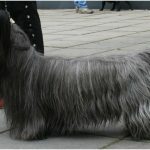 The price of the Skye terrier is about $1000 USD on an average and may vary based on the availability. 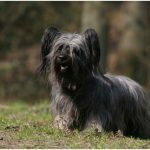 The Skye Terrier is double coated with short, soft under coat and harsh, long haired outer coat. They come up with both prick ears and drooped ears which are totally covered by long hair. The hair on the face almost covers the forehead and forms a beard and moustache. 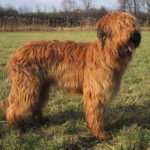 They are medium sized dogs with long body which is twice than its height. The Skye comes in different colours like black, blue, dark grey, light grey, fawn, cream and silver. Usually, male Skype Terrier measures about 9 to 10 inches (24 to 25 cm) in height and weighs about 35 to 40 lbs (16 to 18 kg). 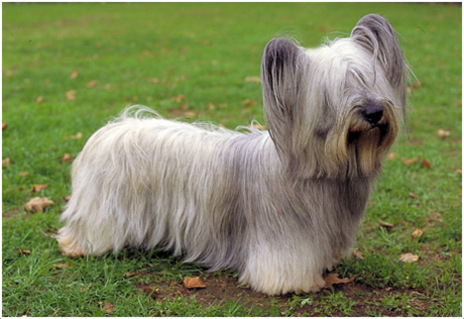 Female Skype Terrier is about 7 to 9 inches (20 to 24 cm) tall and weighs about 25 to 30 lbs (11.5 to 14 kg). The Skye is an amazing pet that any family would like to raise. This is polite, funny, playful, energetic, loyal and kind natured dog. This is bold, smart and watchful dog, Skye starts barking at the sight of strangers. They don’t make friendship with strangers very easily. Skye always want attention towards it and becomes bored and unhappy if neglected. They have strong memory and they are intelligent. The owners need to socialize the Skye in the younger age itself. 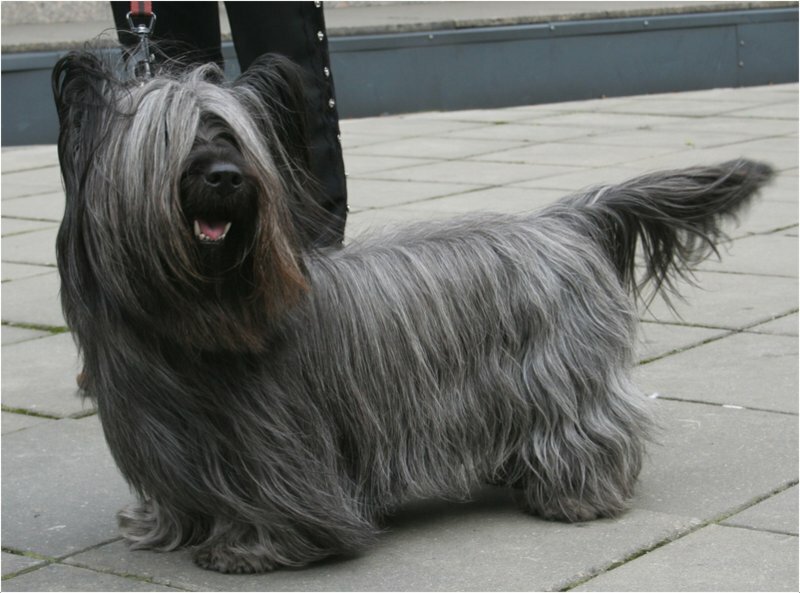 Generally Skye Terrier is a healthy breed and fewer health issues are noted. The most prominent health issues are orthopaedic or bone problems, mammary cancer and disc problems. Too much exercise, jumps and very long walks at younger age may cause bone damage to the pet. As they are short legged long animals disc problems and bone damage may occur very frequently. General checkups and consulting the vet when health problems arise would keep the pet fit and healthy. High quality feed which comprise of dry or liquid food should be fed to the pet. Mostly dog food is advised for pet’s good health and fitness. The daily feed should contain about 2 cups of feed for the pet. Do not over feed the dog or it may result in over weight problem. They do well even in the small apartments and they are active and playful in the indoors. In the rural region, the yards should be fenced to protect the pet from external animals. They can fit to any type of environment either in the cold weather or warm weather. But this is sensitive to too much of any type of weather. The Skye needs a daily walk and little physical exercise to keep it fit and healthy. The younger Skype should not jump or climb heights or it may cause leg injury very easily. If not physical exercise then sufficient play in the yards would be enough to maintain its fitness. They are aggressive sometimes towards some stranger dogs or they need to be leashed outside the house. 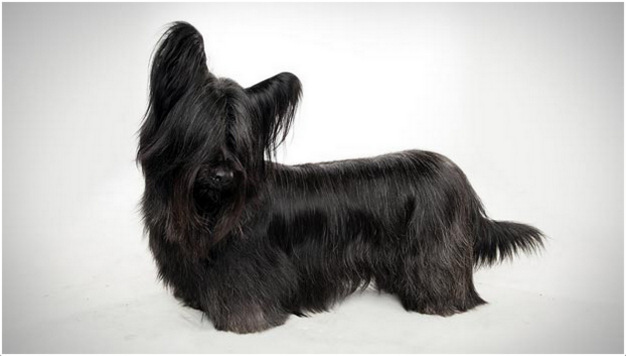 The Skye gives birth to 4 to 8 puppies on an average at a time. They need proper attention and good care during the time of pregnancy and whelping. Puppies and the parent pet should be taken care properly to keep them healthy. In case of any complications vet’s advice should be taken. Unleashing on daily walks would be dangerous to the Skye as this may chase small animals. Sometimes some aggressive dogs and bigger animals may provoke Skye into fights. The pet should be protected from dog thieves. 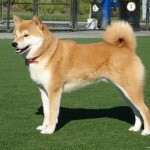 This breed is about to extinct due to its low popularity and high price tag. 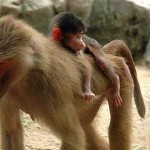 So breeding is a little difficult process but at a proper this breed need to go for professional breeding. 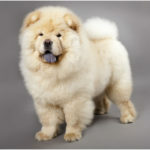 The pet’s health condition should be in good state during this process. The average life span of Skye is about 12 to 15 years. Good attention towards the pet’s health and fitness makes them live longer than the actual span. Brush the coat at least twice in a week to avoid formation of mats, tangles and untidiness. Occasional bathe like twice in a month will be fine to keep the pet clean. To maintain the dental hygiene brush the teeth regularly. Trim the nails if they are grown up or at least thrice in a month. Clean the surface around the eyes and mouth, clean the ears to avoid formation of wax inside the ears. If possible professional grooming will be best for the Skye. 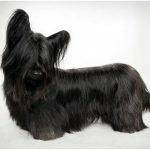 The Skye sheds moderately and if the pet is not maintained properly then shedding may increase. Regular grooming avoids heavy shedding and also decreases the amount of shedding or hair fall. 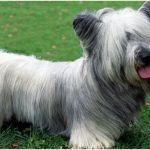 The pet should be clean and tidy to maintain the pet’s coat quality. Male Dogs : Cater, Zoobie, Randy, Champ, Bear.